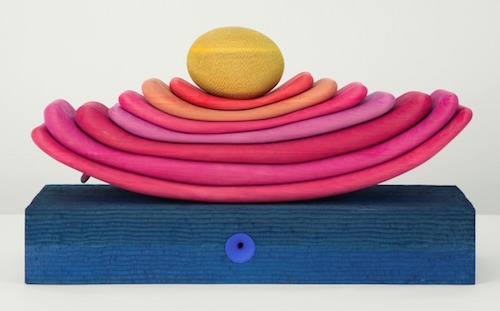 Matthew Ronay, The Kernel, 2016, basswood, dye, gouache, steel, 18 x 31 1/2 x 11''. As an extension of a lecture he gave in March 2016 at Miami’s Pérez Art Museum, Matthew Ronay contextualizes his own recent wood sculptures with works by Fernand Léger, Serge Charchoune, Terry Riley, and Graham Marks to investigate how abstraction can intuitively tap into and communicate elemental concepts. With the exception of Léger’s foreboding, nebulous form in Green Foliage, 1930, the artist’s graphic, object-centered works struggle to transcend their subject matter and are the least effective here. But we do get a rare opportunity to view the work of Léger’s contemporary, Charchoune, an overlooked painter and poet who hopscotched between genres, eluding categorization. Ronay’s selections illustrate Charchoune’s eclectic approach to abstraction, from doodled symbols to dense monochromes. Charchoune’s vibrant, symmetrical seascape, La croix marine (The Navy Cross), VII-VII, 1950, looks like the direct inspiration for Ronay’s sculpture The Kernel, 2016, a boat of stacked tongues carrying a spongy egg across a rippled slab of azure-stained basswood. Ronay transforms his material into supple, velvety forms that playfully allude to the body—arterial tubes, porous sacs, and juicy folds. In contrast, Marks embraces the imperfections and grittiness of clay to create heavy earthen sculptures that resemble overgrown seedpods or geological specimens. As Riley’s undulating and hypnotic compositions wash over the exhibition, ebbing in and out of our awareness, Marks’s sculptures lie in repose, functioning as punctuation marks. Performed on an electronic organ modified with digital delay loops, Riley’s drone-heavy, raga-like pieces, including Shri (Mister) Camel, 1980, play from a wall-mounted turntable, though they might as well be transmitted from an interstellar church. For Ronay, these varied abstractions are more than a reduction of forms—there is a consciousness that connects the works to one another, and forces far greater.